It is not known exactly how many roles Shakespeare played himself but we do know that Shakespeare had began his career on the stage by 1592, because there is reference to this in Robert Greene's Groatsworth of Wit. 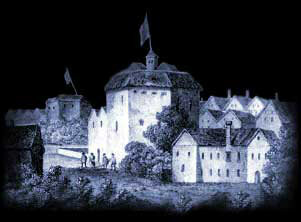 It is probable that Shakespeare played the title role in Edward I (a play by Edward Peele) in 1593. It is also assumed that he played smaller roles in a variety of his own plays, including As You Like It (Adam), Macbeth (King Duncan), Henry IV (King Henry), and Hamlet (Hamlet's father). Shakespeare's first biographer, Nicholas Rowe, referred to a role by William Shakespeare as "the Ghost in his own Hamlet" and that he was "the top of his performance"
The Chamberlain's Men, of which William Shakespeare was a founder member, were the most important company of players in Elizabethan England and led by the Burbage family and William Shakespeare. Initially known as known as Hunsdon's Men, whose patron was Henry Carey the first Lord Hunsdon. Hunsdon then took office as the Lord Chamberlain. The Chamberlain's Men were taken under the royal patronage of James I in March 1603 and were then known as the King's Men. The main rivals of the Chamberlain's Men were the Admiral's Men Acting Troupe led by Edward Alleyn and Phillip Henslowe. The following documented facts are related to William Shakespeare and his life as an Elizabethan actor together with details of his relationship with fellow actors. The will of Augustine Phillips who died on 4 May 1605 bequeathed "to my Fellowe William Shakespeare a thirty shillings peece in gould, To my Fellowe Henry Condell one other thirty shillinge peece in gould..."
The 1616 Folio of Ben Jonson's Works contained cast lists for his plays. The cast list for Jonson's Every Man in His Humor, which was performed in 1598, includes "Will Shakespeare, Aug. Philips, Hen. Condel, Will. Slye, Will. Kempe, Ric. Burbadge, Ioh. Hemings, Tho. Pope, Chr. Beeston, and Ioh. Duke.". The cast list for Jonson's Sejanus, performed in 1603, includes "Ric. Burbadge, Aug. Philips, Will. Sly, Ioh. Lowin, Will. Shake-Speare, Ioh. Hemings, Hen. Condel, and Alex. Cooke." The account of Sir George Home, Master of the Great Wardrobe, lists the names of "Players" who were given four yards of red cloth apiece for the investiture of King James in London on 15 March 1604. They are "William Shakespeare, Augustine Phillipps, Lawrence Fletcher, John Hemminges, Richard Burbidge, William Slye, Robert Armyn, Henry Cundell, and Richard Cowley." Here Shakespeare appears first among his fellows. Interesting Facts and information about the History, Life & Times of the famous Elizabethan actor, William Shakespeare the Actor. Additional details, facts and information about the Globe Theatre and other actors can be accessed via the Globe Theatre Sitemap.